Lorna`s Laces offers this pretty pink pullover designed in Shepherd Sport combining stockinette stitch with a eyelet pattern on sleeves. 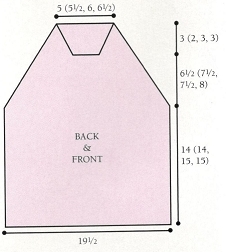 To fit Misses’ sizes Small (Medium, Large, X-Large). Directions are for smallest size with larger sizes in parentheses. It only one figure is given, it applies to all sizes. Finished Bust: 39 (42, 45, 48) in. Back Length: 21/2 (23 1/2, 25 1/2, 26) in. Circular knitting needle 16 in. long in size 3 U.S.
6 sts and 8 rows = 1 in. with Lorna’s Laces SHEPHERD SPORT and larger ndls in pat. 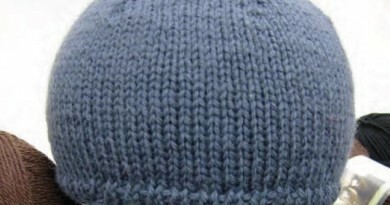 Knit rows: K 1, ssk, knit to last 3 sts, k2tog, k 1. Purl rows: P 1, p2tog, purl to last 3 sts, p2tog tbl, p 1. Rows 5 & 6: Knit. Row 7: (K2tog, yo) across, end k 1. 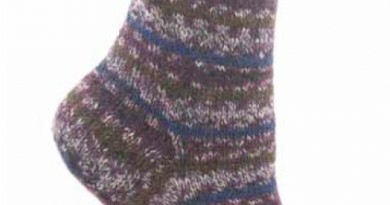 Row 8: Knit. Rep Rows 1 – 8 for St st and Eyelet pat. With smaller straight ndls, CO 119 (125, 137, 143) sts. Work 6 rows St st. Turning row (RS): (K2tog, yo) across row, ending with k 1. Next row (WS): Purl dec 1 st at end of row. With larger straight ndls, work in St st until piece meas 14 (14, 15, 15) in. above turning row. times. BO rem 30 (34, 36, 40) sts. Work same as Back until piece meas 20 1/2 (2 1/2, 22 1/2, 23) in. from beg. Shape neck: BO center 18 (20, 20, 22) sts. Joining another ball of yarn and working both sides at the same time with separate balls of yarn, cont raglan shaping as for Back: AT THE SAME TIME, dec 1 st each neck edge EOR 6 (7, 8, 9) times. Fasten off. With smaller straight ndls, CO 82 (84, 88, 94) sts. Work 6 rows St st, dec 1 st at each edge on every RSR – 76 (78, 82, 88) sts. With larger straight ndls, work in St st and Eyelet pat, inc 1st each side every 2 rows 3 times, then every 3rd row 6 times (EOR 2 TIMES, every 3rd row 6 times; EOR 12 times; EOR 10 times) -(96, 106, 108) sts. Cont even in est Sleeve pat until piece meas 3 in. above turning row. Shape cap: Maintaining pat, BO 10(10, 11, 11) sts at beg of next 2 rows. Foil dec row pat, dec 1 st each side EOR 28 (31,35, 34) times, then every 3rd row 6 (4, 4, 6) times. BO rem 6 sts. Sew Sleeves in place. 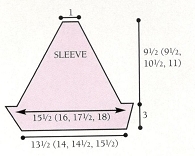 Sew side and Sleeve seams. Neck edging: With RS facing and circular ndl, PU 112 (114, 116, 120) sts around neck edge. Do not join. Work 4 rows St st. Work turning row as for Sleeves and body, then 4 more rows St st. BO loosely. Turn hems on Sleeves, body and neck to WS and sew loosely in place. Are you a spin-off of the Knit-n-Style magazine? It was one of my favourites! I really miss it! 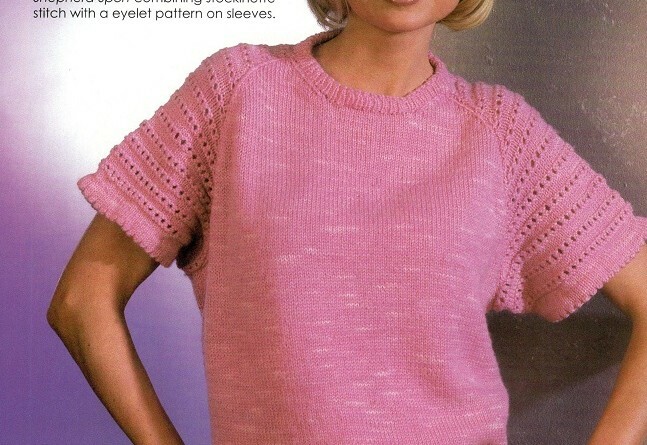 I was wondering if the Think Pink Sweater could be made in the round. Do you have any suggestions?